Description. The shell is oxycone and very involute (U/D is about 0.04) with an intermediate expansion rate. The whorl section is compressed, with WB/WH approximately 0.30. The overhanging umbilical walls bend narrowly into slightly concave inner flanks. Whorl breadth is greatest at mid-flank. The outer flanks converge towards the very narrowly rounded venter. The test is faintly ornamented with a row of bullae at mid-flank (4 to 5 per quarter whorl) and a row of weak crescent ventrolateral ribs (6 to 7 per quarter whorl). The two rows are linked by feeble ribs. The suture line is moderately incised. The E/L saddle is incised by two adventive lobes. DESCRIPTION.- This species is rare in the Prairie Bluff Chalk, occurring as phosphatic fragments of phragmocones that have whorl heights of up to 44 mm. Whorl section oxycone with whorl breadth to height ratio of up to 0.4. Small, slightly bullate midlateral tubercles present, and twice as many outer lateral bullae that merge into a concave crescentic rib on outermost flank. A very feeble, straight, prorsiradiate rib links tubercles. Suture with narrow-stemmed saddles and up to 10 auxiliary elements on umbilical lobe. DESCRIPTION.- AMNH 47118 is a phragmocone 69.8 mm in diameter with part of the innermost flanks missing and most of the venter worn off (fig. 22). The specimen is involute with a very small umbilicus. The umbilical wall is steep and convex and the umbilical shoulder is sharply rounded on the adapical end of the specimen. The inner flanks are concave and the middle and outer flanks are broadly rounded on the adapical end of the specimen. Rectiradiate, straight, broad ribs are visible on the adapical onehalf of the specimen. There is a row of five radially elongated nodes on the midflanks with a distance of approximately 12 mm between the two most adoral nodes. Two nodes are preserved on the outer flanks on the right side. Type: The holotype is USNM 9888, which is the specimen of Conrad (1857, p. 159, pl. 15, fig. 1) by original designation. This specimen is said to be from “Jacun, 3 miles below Laredo”, although it may have been found in the Escondido Formation of the Rio Grande region in Maverick County, Texas (see Stephenson, 1941, 1955). Material: Nine crushed fragments of phragmocones from the base of the middle member of the Cárdenas Formation in the Arroyo de la Atarjea and at the railway section near Cárdenas, one fragment from the Tanque Formation south of Reata, Coahuila, ten specimens from the upper Escondido Formation at Cuevas Creek near Eagle Pass, Texas. Occurrence: This Maastrichtian species is common to abundant in the Cárdenas and Escondido Formations in Trans-Pecos, Texas, and northeastern Mexico (Böse, 1928; Stephenson, 1941, 1955). It was also described from northeastern Texas (Kennedy and Cobban, 1993b), Mississippi and Alabama, Missouri (Stephenson, 1955), Tennessee (Kennedy and Cobban, 2000), and Maryland (Kennedy et al., 1997). In the Western Interior, this species was recorded from the Baculites clinolobatus to Jeletzkytes nebrascensis ammonite zones (e.g., Kennedy et al., 1996; Landman and Cobban, 2003). Discussion: Sphenodiscus pleurisepta differs from the almost smooth S. lobatus by its stronger ornamentation. It differs from Coahuilites sheltoni Böse by a narrower whorl section (smaller WB/WH ratio) and a much more acute venter at comparable diameters. MATERIAL.- One specimen, USNM 463 1 15, plus several small fragments. TYPE.- The holotype is USNM 9888, said to be from "Jacun, 3 miles below Laredo," but probably from the Escondido Formation of the Rio Grande Region, probably in Maverick County, Texas (Stephenson, 1941, 1955). DISCUSSION.- Presence of two rows of tubercles in early growth distinguishes S. pleurisepta from S. lobatus, as noted above; it differs from Coahuilites sheltoni Bose (1928), described below, in its compressed, oxycone whorl section, rather than parallel sided with broad, fastigiate venter. OCCURRENCE.- Maastrichtian Prairie Bluff Chalk at locality 16 near Starkville, Mississippi. The species also occurs in the Escondido Formation in Trans-Pecos Texas and northern Mexico, Corsicana Formation in northeast Texas; Owl Creek Formation in Missouri, Mississippi and Tennessee; and the Severn Formation in Maryland. 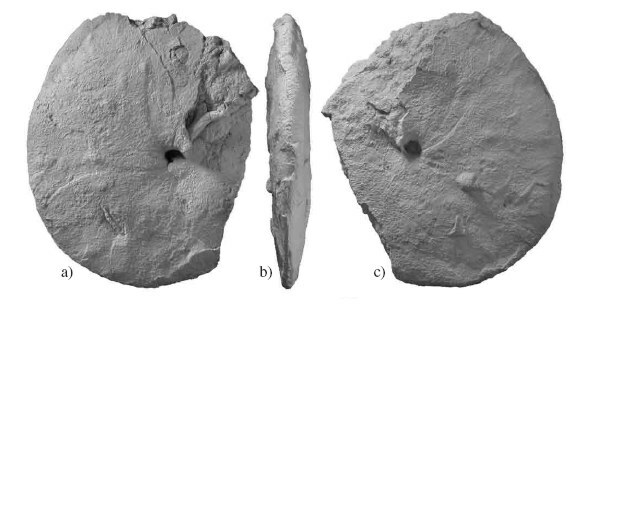 In the Western Interior, it occurs in Hoploscaphites nicolletti and Jeletzkytes nebrascensis Zones, and Landman and Waage (1993) record S. ?lenticularis from the Hoploscaphites birkelundi Zone in the Fox Hills Sandstone in Wyoming and Colorado. TYPE.- The holotype is USNM 9888, said to be from ‘‘Jacun, 3 miles below Laredo’’, but probably from the Escondido Formation in the Rio Grande Region, Maverick County, Texas (Stephenson, 1941, 1955). MATERIAL.- AMNH 47118 from the New Egypt/Hornerstown formational contact, AMNH loc. 3345, Parkers Creek, near Eatontown, Monmouth County. DISCUSSION.- The presence of two rows of nodes on the flanks distinguishes Sphenodiscus pleurisepta from the widely occurring Sphenodiscus lobatus. Cobban and Kennedy (1995) discussed the synonymy of S. pleurisepta and its differences from congeneric species. Because this species has an unusually long range (the entire upper Maastrichtian), it is possible that more than one species is masquerading under this name. It is probably a good idea to closely compare samples of this species from opposite ends of its stratigraphic range. OCCURRENCE.- New Egypt/Hornerstown formational contact, Parkers Creek, near Eatontown, Monmouth County. Sphenodiscus pleurisepta has not previously been reported from New Jersey. It also occurs in the Crosswicks Creek Drainage in southwestern Monmouth County (Landman et al., in prep. b). Elsewhere on the Gulf and Atlantic Coastal Plains, this species is known from the Owl Creek Formation in Missouri, Mississippi, and Tennessee (Kennedy and Cobban, 2000), the Prairie Bluff Chalk in Mississippi (Cobban and Kennedy, 1995), the Corsicana Formation in northeast Texas (Kennedy and Cobban, 1993), and the Severn Formation, Prince Georges and Kent counties, Maryland (Kennedy et al., 1997; Landman et al., 2004). It is known from the Escondido Formation in Trans-Pecos Texas and northern Mexico (Stephenson, 1941, 1955). In the Western Interior, this species occurs in the Hoploscaphites birkelundae Zone of the Pierre Shale in Meade and Pennington counties, South Dakota (Kennedy et al., 1996; Larson et al., 1997), the Fox Hills Formation in Niobrara County, Wyoming (Kennedy et al., 1996), and the upper part of the Pierre Shale and Fox Hills Formation in Weld County, Colorado (Kennedy et al., 1996; Landman and Cobban, 2003). 1955 Sphenodiscus pleurisepta Conrad. - Stephenson : p.135 pl. 24; fig. 1-4? Descriptions of Cretaceous and Tertiary fossils. A Textbook of Geology, Part 2. The Upper Cretaceous deposits [Mississippi] . Mississippi Geological Survey Bulletin Vol. 40 p. 296 pp.